Sometimes being wired to your PC or console while gaming creates some issues. The cord gets caught on things, or drags down your head on one side, or other people trip over it. So why not do away with the cables and get a wireless gaming headset? It solves all the problems and you can still get phenomenal sound without the wires. Today we check out a smattering of wireless gaming headsets that are offered from some of the largest gaming gear manufacturers. The main features that one should be looking at when in the market for a wireless gaming headset include headband padding, ear cup size and padding, sound shape (stereo vs. surround), equalizer settings, frequency response range, connectivity, and battery life. These features add up to the audio experience you want to have while playing your favorite video games with a wireless gaming headset supplying sound. Here’s our list of recommended wireless gaming headsets. Creative has been making audio gear for computers since the days of having to install a sound card to get sound out of your PC. It’s no surprise that they’re still making sound gear, specifically wireless gaming headsets. Their Tactic3D Rage V2 is a good low budget entry into the market. The Tactic3D Rage V2 attaches to a PC or Mac via a 2.4Ghz USB transmitter. On the sound front it utilizes Creative’s SBX PRo Studio which is able to create a virtual surround sound that drives the 50mm speakers who have a frequency response range of 20Hz~20kHz. The noise cancelling microphone is detachable so the headset can double as standard headphones. Also offers PS4 support. Asus, mostly know for monitors, has also diversified their product offering with other gaming gear. 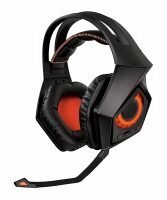 The Republic of Gamers (ROG) STRIX wireless gaming headset is a 2.4Ghz USB connection for PC and PS4 and has a cable to attach to the Xbox One controller. 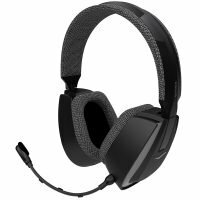 It’s also a stereo wireless gaming headset with virtual 7.1 surround sound through software and has a 20Hz-20kHz frequency response. The microphone is a detachable, uni-directional boom microphone with a 50Hz-16kHz response. The battery in the ROG STRIX is stated to last up to 10 hours. The nice thing here is that the ear cup cushions are replaceable, something not easily done on all wireless headsets. Klipsch has been a big name in high end audio for decades. Now, they too are turning to gamers to diversify their products. 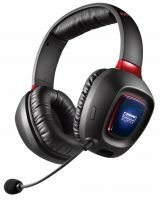 The KG-300 is their entry into the wireless gaming headset market. This stereo headset has a 16Hz – 23kHz frequency response (outdoing most others), and four preset EQ settings. The KG-300 can be used on the Playstation 4, Playstation 3, Xbox 360, and PC. Xbox One support requires an additional adapter. They don’t come with rechargeable batteries and are stated to have a 10-hour battery life, so gamers should have a lot of AAA batteries around or at least six AAA rechargeables. Turtle Beach has made audio gaming products for decades and this wireless gaming headset shows it. Aside from all the Call of Duty: MW3 branding, the Ear Force Bravo has rechargeable batteries that allow for up to 10 hours of play. They’re also made specifically to be used with Call of Duty MW3 and has developer made custom audio presets to be used with it. Gamers can also make up to eighteen personalized presets on the Turtle Beach website. The Ear Force Bravo also has sound tech in it to reduce the intensity of crushing explosions and eliminate background noise from the mic. Additionally, this helps keep your ears in the game and can even be taken a step further with the Sonic Lens which lets you narrow in on specific types of sounds like crunching footsteps, or vocal noises. All the better to get them before they get you! 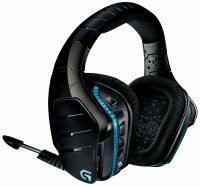 Logitech offers their G933 Artemis Spectrum wireless gaming headset. 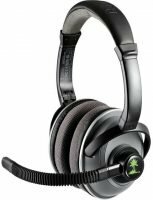 This is the only true 7.1 Surround Sound wireless gaming headset in this round up (either 7.1 Dolby or DTS Headphone: X). They connect via wires or can go wireless. Not to mention they’re compatible with consoles, PC, mobile devices and your home theater. The Spectrum RGB feature speaks to the fact that the RGB lighting is customizable. 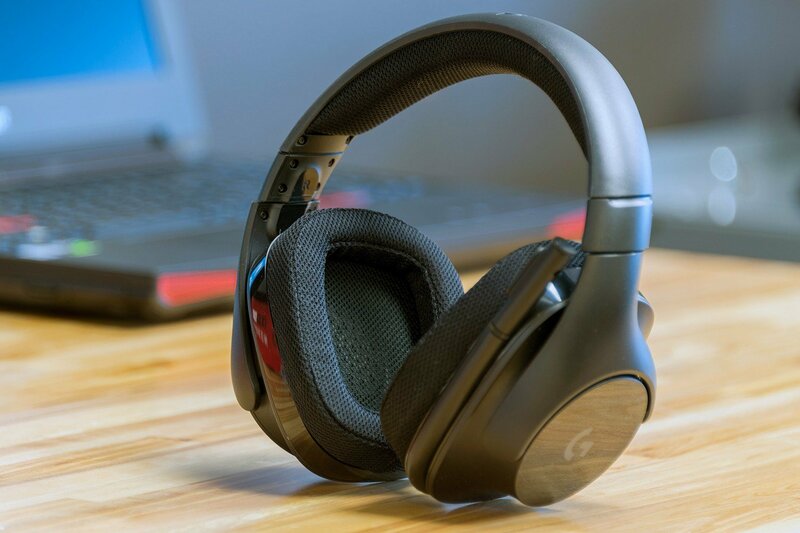 Moreover, the G933 Artemis also has twelve hours of rechargeable battery life with no lighting at 50% volume. And as for sound, it has a 20Hz-20KHz frequency response range, and 40mm speaker drivers. Customizable RGB lighting from 16.8 million colors. Easy-access on-headset audio and G-key controls. No matter what your budget is, you’ll be able to find a wireless gaming headset that fits your wallet, and your head. GamingHardwareReviews.com is a participant in the Amazon Services LLC Associates Program, an affiliate advertising program designed to provide a means for sites to earn commissions by advertising and linking to amazon.com. Amazon, the Amazon logo, AmazonSupply, and the AmazonSupply logo are registered trademarks of Amazon.com, Inc. or its affiliates.